Each Group Package Offer provides you with a Discovery Guide, Event Price List and Facility Layout that matches your Event Type. Here’s an overview of our booking process, from start to finish. Entering your name and email will get you our Top 10 Reasons Discover guide PDF, Weekend price list PDF and Facility map and layout PDF. You will also be given the opportunity to converse via email or phone with one of our facility owners or office manager. Get your list of questions ready and they will be happy to answer them. Also, be prepared with as much information about your event as possible so that the Event Expert can efficiently and effectively assist you and provide you with a customized quote. 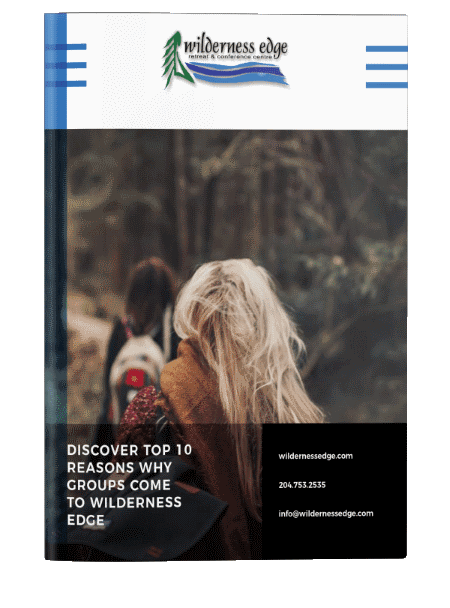 If you’re a group leader or event planner considering Wilderness Edge as an event venue, it’s important that you see and experience Wilderness Edge firsthand. If you have never been to Wilderness Edge, your overnight site visit is FREE! Take a tour, meet the staff, enjoy a delicious breakfast in our dining room, and soak in the beauty of our Whiteshell Park surrounding area. During your official tour, we’ll show you our meeting rooms, and answer all your questions. We’ll help you determine if our unique venue is the best fit for your event. We’re confident that your stay with us will be helpful and that you’ll leave with all the information you need to make an educated decision. When you sign a contract with us, it secures your lodging, meals and meeting space for the duration of your event at Wilderness Edge. We can contract groups that have at least 20 guests and offer them our package rates and group benefits at any time. Your Event Expert will work with you on your contract, which includes your payment plan, with an initial 10% deposit to get you started. We accept e-check, organizational checks, and credit cards. After your event is booked, you’ll be assigned an Event Coordinator who will reach out to you about 6 weeks before your event. Your Event Coordinator will assist you with all the details leading up to your group’s arrival and will also be ready to assist you during the duration of your event, making sure everything goes smoothly and according to plan. FAQ’s for our group leaders – you are in the right spot. Some of my group members have special dietary needs. Can Wilderness Edge help? If a guest has a specific allergy or dietary needs, enter that information into our PDF Booking Form that is provided by our Event Expert. Please have each guest entry completed 2 weeks prior to arrival. For food allergies, we exempt the use of an allergen in our regular meal plan when able, but do not alter the existing menu. For vegetarian and special diet requests were we prepare special food there is an additional fee. Our chefs will be happy to accommodate each person. Using the PDF booking form you can select a wide range of meal times to customize it to suit your agenda. If you request times that are quite far from our normal times there are additional fees. All group meals are served buffet style. The menu is “chef’s choice” and is usually a choice of two main entrees, vegetables and a starch (potatoes, rice or pasta). A full salad bar is provided at lunch and supper. Daily menus are posted outside the dining room. Will our group get to sit together in the Dining Room? Yes, each group staying here has their own unique meal time and you will be going through the buffet line together and sitting down together. What options do we have for snacks? Your group will be provided an evening snack at 9pm in our dining room. We commonly provide freshly baked cookies, a variety of flavor bagged potato chips, and apples, bananas, and oranges every evening with our groups. There are punch and filtered water beverage machines in our dining room along with a hot water station for tea, and also coffee with a choice of milk, creams, and sweeteners. We do have special meeting room options if you would like to have meat platters, cheese and crackers platter or anything else from our menu within the PDF Booking Form Meeting Room Meal Options area. May we bring our own snacks/drinks for our meeting room? Yes, BUT please do not bring any peanut items as there are a lot of people with allergies that may use that meeting room soon after you. May we choose our own menus? Is a meeting room included in our retreat package? Wilderness Edge provides inexpensive meeting space you select in your PDF booking form. By charging a small fee we are able to give each group a choice of where they are meeting instead of assigning them to the smallest room that will fit everyone. We think it is a better way to book meeting rooms. May I pick my meeting room? Yes, your meeting room is chosen by you to match the individual needs of the group. Some groups need one room, other need various breakout rooms and meeting spaces. You choose the meeting room space that works for your event. See our PDF Booking Form for details. What is included with our meeting room? Meeting rooms are set with the appropriate number of chairs for your group size, a podium in the front and a table in the rear. Each room comes with with a screen or large 65″ – 70″ TV and general room lighting. Your booking form gives you a number of different options including setup styles (i.e. theater-style rows, semi-circle, classroom style, etc.). Work with your coordinator and event expert to determine what will best fit your group in your assigned meeting room. Additional charges may apply depending on your audio/video or other needs. What if we need an extra meeting room / breakout rooms? You select the space you need in the PDF Form provided to each group leader. Each group is unique and our booking form allows you to select one or many meeting spaces. May I request special set up? Yes, we generally charge $2 per person, per setup if our staff do the setup for you. Consult the PDF booking form for complete details. Your meeting room is available exclusively for your group for the duration of your contracted retreat times. Guest rooms are generally available for check-in at 4 pm daily. Your PDF Booking form allows a huge amount of flexibility in regards to check-in times starting as early as 8 am. Early check-in options are an additional cost to the event. Check out of guest rooms is at 10 am the day you are leaving. Keys simply need to be dropped off at the front desk (into a bucket) by 10 am. Check out of the building is only at 2pm, so that gives you time to still enjoy your morning and have lunch with us before you leave. Yes, as long as we have the space available. If you anticipate having more people than you had contracted for, make sure to let your event coordinator know as soon as possible to ensure that there is space available. (Space meaning: guest rooms, meeting rooms and dining room). Adding more people to the rooms you already have reserved is not usually a problem, but it’s always a good idea just to let your coordinator know if you are expecting more people whether you need more rooms or not to ensure that there is enough space in your meeting room and enough food ordered in time. How many people can I put in a room? We have a wide variety of guest room types. Some have one bed, other two and even others four or five. We have standard rooms and two room suites. Talk with your event expert or consult our website for complete details. Suffice to say we have a lot of room and a lot of beds in this place. If you all book the same room type, then most likely you will all be on the same floor or wing. The earlier you book your event, the better the room selection. Is there a camping option for my group? We do have a large yard where people do occasionally tent. Due to local by-laws you are required to be registered as an overnight guest in our centre with a hotel room. So it does not save you any money to tent, but for some, it’s just the thrill of being outdoors. As a registered guest, you have private access to that guest room and use of the showers and washrooms as well as a place to go to if it starts to rain in the middle of the night. Rooms are assigned by your group leader inside our PDF booking form. It is all done electronically and works extremely efficiently. If your group is less than 10, you don’t qualify for group status but instead, book using our online room reservation system. What should I know before calling to contract my group? We need to know the type of event you are planning (i.e. women, youth, couples), as well as the number of guests that will be attending. Please have a couple of possible dates in mind so we can check availability. What is included in my retreat or conference package? Wilderness Edge package rates include lodging, meals and a wide variety of recreational activities. A meeting room is provided at a small additional fee for groups with a valid contract. What are the benefits of having a group contract? Wilderness Edge Meal & Lodging package rates include lodging, meals, meeting space and a wide variety of recreational activities. Each group is assigned an event expert to assist with meeting room, rooming list, and agenda needs. We’ll work with you on a payment plan, with an initial 10% deposit to get you started. How many people do I need to have to qualify as a group? We are able to contract groups that have at least 10 guests if we already have another group of 20 or more. All groups of 10 or more that are accepted into our system have access to all our package rates and group benefits at any time. Groups of 10-19 guests are permitted to book with a group contract within 60 days of the event. Groups of 20 – 29 more guests may book up to 6 months in advance. Groups of 30 or more guests may book up to 13 months in advance. Groups of less than 10 guests may contact Reservations directly to book as Personal Retreat guests within 30 days. Sandy Cove has 140 guest bedroom and about 100 guest rooms in total that can accommodate up to 300 overnight guests. Additional overnight guests can be accommodated in our local hotels. With special arrangements and use of a large outdoor tent we can accommodate groups of 400 for meal services. Package rates include lodging, meals, meeting space and a variety of activities. Please call to discuss the specific rates for the type of rooms and occupancy you have in mind. Are there taxes and gratuities? If you are a tax-exempt organization, you will not be charged the tax you are exempt from. There are no other gratuities or surcharges. Some groups like to add on audio/visual equipment to enhance their retreat. Our amazing outdoor activities are very popular and provided to our overnight guests at deep discounts. All prices are listed inside the PDF Booking form and it will tell you at all times the price of your selections. Can you accommodate youth groups? Yes, we can. Typically youth retreats are booked within 6 months of the event date and we have special reduced rates for those 15 and under. If we bring a women’s group, will there be men’s groups at Wilderness Edge? On any given weekend, Wilderness Edge can host between 1 to 3 groups. While you do share dining space and recreation facilities, each group is assigned their own designated meeting space. Yes, we do…but keep reading. We encourage you to disconnect from technology in order to reconnect with family, friends and your unseen inner world. However, we understand that not everyone can completely disconnect. So we are happy to offer FREE wireless access throughout Wilderness Edge Retreat and Conference Centre and a computer kiosk is located near the office for those wanting to use our computers. Cell coverage is generally good on the grounds, but can diminish the “deeper” you get into the retreat centre. May I bring my own sound/video system? Yes. Sound systems, projectors, and other AV items for the meeting rooms are available for a rental fee or you may bring your own. If you would like to rent equipment, reserve it through your PDF Booking Form in the Meeting room options area. Each meeting room comes with either a screen for a projector or a large flatscreen TV 65″ – 70″. May I rent your system and substitute some of my personal equipment? Absolutely, provided that the system is compatible with what you are bringing. Due to our room setups and our desire to give you the best reliability possible, we cannot break up our sound or video packages. How do the equipment rates work? The rates are for the whole retreat. So you have all your equipment the entire time your here making it very easy and convenient. How do I get to Wilderness Edge? Yes! We have a large parking lot. Are there limits to how many vehicles we can bring? No, although we encourage you to car pool if possible. If you are a group of 300 or more then we can talk about it. Do you have any suggestions for transporting my group to Wilderness Edge? Winnipeg River Charter Services provides motor coaches of all sizes. Winnipeg International Airport is located about 1.5 hours west of us. Winnipeg River Charter Services provides from vans to motor coaches so they may be your best option. Beaver Bus lines also comes out here as well. We have served groups right across Canada and the United States as well as people from 50 other countries over the last 20 years. We Reimers have appreciated your superb hospitality so much! Thank you! You have helped create wonderful memories and renewed togetherness for all of us. Great location for large group retreat! We had an occasion recently to spend our 35th Wedding Anniversary at your hotel. The staff was most helpful and friendly. We loved the turkey dinner on Sunday. Thank you so much for making our stay so very pleasant. That made it even more special! We’ll both be seeing you again real soon. Just a note to thank you for … the great August long weekend family reunion we had their. Your facilities were great + the food was as well. It was great spending the weekend there. It was very enjoyable for the kids. Plenty of room for them to run. Thanks for the good time. Hope to see you again sometime in the future.